It is freezing in the Western Cape at the moment. Yes, I know I proclaimed my love for winter just the other day, but it would be nice if the temperature could be dialed up to juuuust a notch above freezing. Just saying. This month Joanne from Eats Well with Others chose Vietnam as the theme for the Regional Recipes event and when I saw that I did a silent "hell yeah!" in my head. Because you see, I love asian food. Chinese take out (the greasier the better), all-you-can-eat buffets and tempting noodle-y dishes at our local Thai place, you name it, and I'll probably like it. Sad thing though: I tend to not cook a lot of asian food at home. Yes I do the odd stirfry, but that's where it stays. Mostly. So this was the perfect opportunity for me to get out of my rut and into my kitchen. Except it was really cold yesterday. And while Asian foods are many things, comforting is not the first word that springs to mind. Or maybe I've just been ignorant so far? But it works! Oh and does it ever. TheHusband and I slurped this motley crue of ingredients right up. And we want more. MOAR I say! Any volunteers for making me another batch? I'm submitting this to Regional Recipes - Vietnam, hosted by Joanne from Eats Well with Others. 1. Peel and core pineapples, discarding only the peel. Chop the cores and puree with 1/2 cup of water in a blender. Strain using a sieve and pressing down on the solids to extract the most liquid. Discard the solids and set the juice aside. Chop the remaining pineapple pieces and set aside as well. 2. Heat 1 tbsp oil in a large pot, then fry the chillies and 2 tsp garlic for a minute or two until fragrant. Add 1/4 cup fish sauce and cook another 2 minutes to reduce. 3. Add enough water to the pineapple juice to make up 8 cups, then add to the pot with the lemongrass stalk. 4. Bring to the boil, then add mushrooms, tomatoes, reserved pineapple pieces and 1/2 tsp pepper. Return to the boil, then cover and allow to simmer for 10 minutes. 5. Meanwhile, heat the remaining oil in a frying pan, add rest of garlic, along with a pinch of chilli flakes and the remaining 2 tbsp of fish sauce. Cook 2 minutes or until reduced, then season chicken with 1/2 tsp pepper and add to the pan, frying briefly until just cooked. 6. Stir chicken into the soup and simmer for 1 minute. 7. Divide noodles amongst serving bowls, then ladle in the steaming hot soup. Sprinkle with chopped herbs and serve. I'm so glad that you're excited about this month's country! Way better than last month! And I'm also glad that it's gotten you experimenting in the kitchen. This soup looks GOOD! This looks pretty tasty! Is that carrots I spy in the picture? Joanne - very excited about Vietnam, thinking of making some more dishes. Great choice! 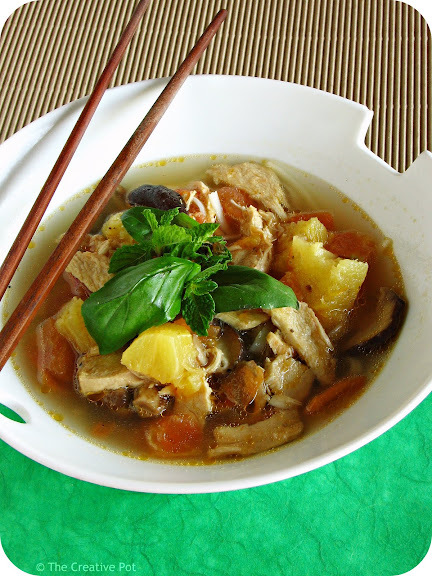 This is one of my all-time favorite Vietnamese soups. 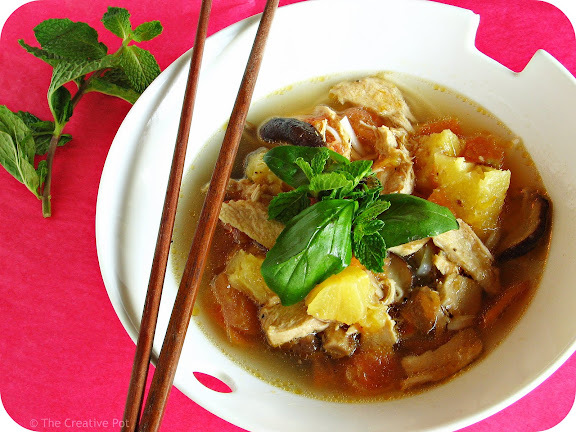 Refreshing, tangy, sweet and sour - so delicious. Pho's popularity is on the rise, but THIS is a must-try soup in my mind. Thanks so much for posting what looks like an awesome recipe. That looks absolutely scrum-diddly-umptious! I can't get over that combination. 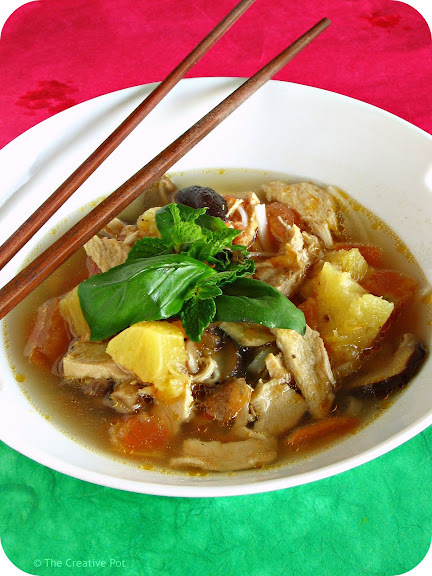 Chicken+pineapple in soup? Must try! Thanks for showing me something new =0.